Diamonds are optically transparent over a wide range of wavelengths, including visible spectra from 400 to 750 nm. Because of this feature, it can be used exclusively for optical mechanical loop components in applications such as sensor technology, fluorescence imaging, and optical biometry. The manufactured components, namely resonators, circuits and wafers, are of high quality and are very popular. 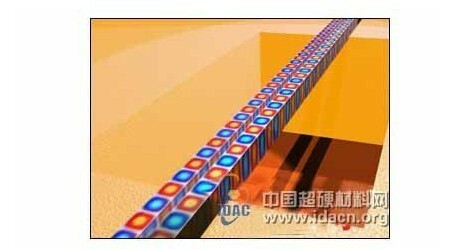 In order to fully utilize photons in the loop, the material needs to have specific optical and mechanical properties. Recently, scientists have made optical circuits for single crystal diamond substrates (high purity crystals with no more than one impurity atom per billion diamond atoms). Such loops must be small, and thus, applications in optical systems require advanced manufacturing methods. In the KIT experiment, polycrystalline diamond made of two parallel independent waveguides is used as a mechanical resonator. For the first time, KIT researchers have made wafer-based optomechanical circuits using polycrystalline diamond. These vibration systems are capable of responding to specific frequencies that excite the resonator to a vibrating state. Although the crystal structure of polycrystalline diamond is more irregular, it is strong enough and easy to process. These special properties make polycrystalline diamonds more widely available than single crystal materials. Polycrystalline diamond can transmit photons almost as efficiently as a single crystal substrate material, and is more suitable for industrial use. Patrik Rath, the first author of the study, said: "Nano-mechanical resonators are currently the most sensitive sensors for a variety of precision measurements. However, it is extremely difficult to handle these smallest components by traditional measurement methods. In our research, the fact that nanophotonic elements of the same size as nanomechanical resonators can currently be fabricated is utilized. When the resonator responds, the corresponding optical signals can be transmitted directly to the loop." Polycrystalline diamond is manufactured in cooperation with the Fraunhofer Institute for Solid State Physics and Diamond Materials in Freiburg, Germany. The research results were published in the journal Nature Newsletter. our 4-5 person tubOur insulation system ensures optimum use of the remaining heat in four settings and therefore you have less energy consumption. An insulation with a layer of aluminum on the outer walls and the bottom ensures that no heat can be released to the outside air. In addition, we use a high-insulating CFC foam for our spas under the cockpit. When the pump is running, the heat it emits is also used again. This way you save a lot of money because you heat the pool and not the environment.